The fatigue caused by chronic fatigue syndrome can be described as overwhelming tiredness which is completely different from what you have experienced before and goes on for at least six months. The fatigue is not caused by exertion or other medical conditions and does not improve with rest. 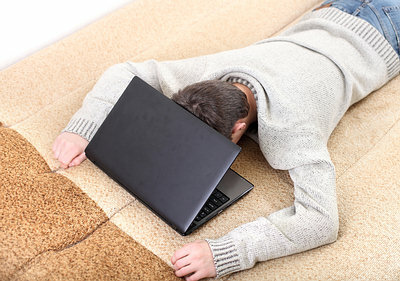 In addition to fatigue, other signs and symptoms of chronic fatigue syndrome include extreme exhaustion lasting more than 24 hours after physical or mental exercise that would normally be considered easy, unexplained muscle or joint pain, headache, tender lymph nodes in the neck or under the arms, sore throat, unrefreshing sleep, and loss of memory or concentration. The exact cause of this complicated disorder is not known. Experts believe that it may be caused by a combination of factors ranging from viral infections to psychological stress. As the thyroid gland controls your metabolism, an underactive thyroid condition called hypothyroidism can cause low energy and sluggishness. With hypothyroidism, you may find it difficult to maintain decent energy throughout the day as you cannot sustain energy long enough. Other signs and symptoms of an underactive thyroid are weight gain or difficulty losing weight, increased sensitivity to cold, muscle aches, constipation, dry skin and hair, brittle nails, hoarse voice, slowed heart rate, irregular menstrual periods, slow movements and thoughts, and depression. The thyroid condition often remains undiagnosed because of these ambiguous symptoms. 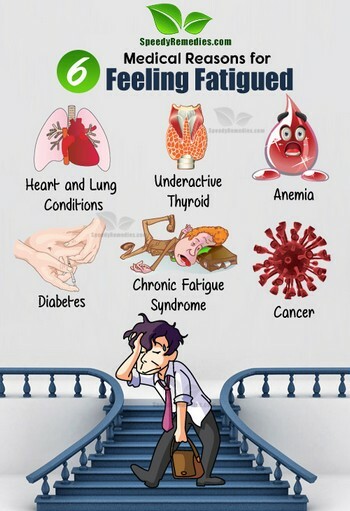 If your fatigue is accompanied by the symptoms mentioned above then it is suggested to see your doctor and get yourself tested for a thyroid disorder. Iron-deficiency anemia is one of the most common causes of feeling constantly run down. Other signs and symptoms are lightheadedness (especially with standing), shortness of breath during exercise, rapid heartbeat, chest pain, pale skin, headache, cognitive problems, and cold hands and feet, frequent infections, swelling or soreness of the tongue, and an uncomfortable tingling or crawling feeling in the legs. People with iron-deficiency anemia may also experience cravings for non-food items such as ice, dirt, starch or pain. Initially, when the disease is mild, the symptoms typically go unnoticed but as the iron deficiency increases, anemia worsens and the symptoms intensify. Both high as well as low blood sugar levels can cause fatigue. With diabetes, the sugar stays in the bloodstream and cannot get into the cells to provide energy. Thus, in spite of having enough to eat, the body runs out of energy. Plus, high blood sugar causes slow circulation which affects the body’s ability to get glucose and other nutrients from the blood into cells. In addition to persistent fatigue, diabetes tends to cause symptoms like excessive thirst, increased urination, and weight fluctuations. You are also likely to feel hungry even though you are eating. Those on strong diabetes medication may also experience fatigue due to low blood sugar levels because of which the cells do not have enough fuel to work well. Weariness or shortness of breath when you exert yourself can be an early sign of heart disease. Due to the reduce ability of the heart, less blood reaches the various tissues and muscles. Thus, it may leave you exhausted after daily activities like cleaning the house, carrying groceries, or even walking and climbing the stairs. In fact, fatigue can be an early sign of heart attack. A study published in the American Heart Association journal Circulation found that 95 percent of the women (who had recently suffered a heart attack) they surveyed had experienced unexplained fatigue and sleeplessness as much as a month before their heart attack. Lung disorders, particularly COPD (chronic obstructive pulmonary disease) can also cause shortness of breath in everyday activities and make you feel tired. Other symptoms include chest tightness, constant coughing, wheezing, and frequent cold or flu. Fatigue that is not relieved by rest or sleep is a common symptom in most types of cancers. It usually comes on suddenly and is not caused by exertion. The exact cause of this cancer-related fatigue is still unknown but factors like the release of proteins called cytokines, hormonal changes, and damage to certain organs may contribute to the problem. This fatigue is often accompanied by decreased appetite and weight loss. Furthermore, cancer treatments such as chemotherapy, radiation therapy, combination therapy, biologic therapy and bone marrow transplant may also cause this problem. Other conditions that may be causing your fatigue include clinical depression, infections such as urinary tract infections, celiac disease, low testosterone levels, sleep apnea, multiple sclerosis and fibromyalgia.